J. Pope-Hennessy, An Introduction to Italian Sculpture, vol. II, Italian Renaissance Sculpture, Phaidon, London, 2002, pp. 150-63. M. Bormand, B. Paolozzi Strozzi, N. Penny (eds. ), Desiderio da Settignano: Sculpteur de la Renaissance Florentine, exh. cat., Paris, 2006. J. Connors, A. Nova, B. Paolozzi Strozzi, G. Wolf (eds. ), Desiderio da Settignano, Venice, 2011. 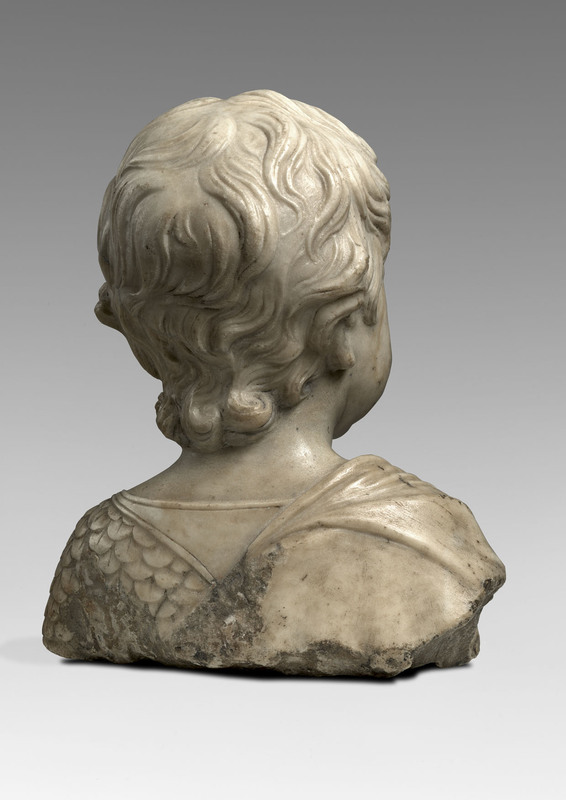 This touching and extremely delicate bust of a child affirms itself as an outstanding example of Quattrocento Florentine sculpture. The antique armour centred by a lion’s head and draped mantle may identify him as an idealised portrait of an unknown sitter, or, more intriguingly, as a Renaissance work of art purporting to date back to the Roman era. The finely carved face, allowing for exquisite effects of chiaroscuro together with the graceful, attentive expression, immediately bring to mind the iconic depictions of children by Desiderio da Settignano, who produced some of the most delicately beautiful sculptures of mid-Fifteenth century Florence. The son of a stone carver, Desiderio collaborated in his youth with Donatello, and throughout his short but spectacular career showed in sculptures the influence of the master’s rilievo schiacciato technique. He also worked on the now lost base for Donatello’s bronze David in the Palazzo Medici. Two documented works by Desiderio serve as touchstones for attributions: the tomb of Carlo Marsuppini in Santa Croce and the tabernacle of the sacrament in San Lorenzo, both in Florence, and testify to his attention to both decorative detail human nature. Indeed, Desiderio’s perhaps most distinctive trait resides in his ability to display a highly spiritual and poetic expression in his figures, be they putti, young Christs or anonymous sitters, as was noted by Giorgio Vasari, according to whom they had “grazia grandissima et leggiadria nelle teste”. 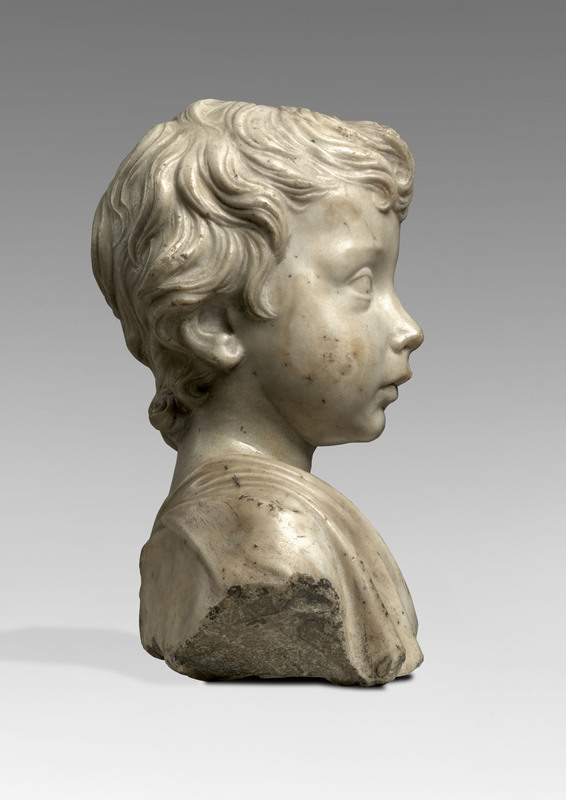 Almost certainly, he invented and perfected the genre of idealised busts of children or young boys, which has its roots in the Florentine tradition of the putto, reinterpreted from the antique, and the Christ child accompanying the Virgin. Desiderio’s legacy aside from the highly refined, decorative elements of his two surviving monuments, would appear to reside in a small group of marble busts, largely of children, young boys or women all convincingly attributed to him. The intent expression and elements such as the delicately rounded orbital ridge, plump cheeks and small, full lips all look back to Desiderio’s examples, and are suggestive of the hand of an unknown sculptor who, although active in the later years of the Fifteenth century, had known and worked closely with the master. The proposed date of around 1480 is sustained by elements such as the tousled hair and the drapery, which can be contrasted with Desiderio’s. Closer in spirit and execution to the present bust are however the angels flanking the tomb of Carlo Marsuppini in Santa Croce, Florence – the monument being one of the artist’s two known commissions, and dating from 1455-59. Desiderio would have been helped by a number of collaborators, some of whom had perhaps trained with him within his workshop. The name of Matteo Civitali (1436-1501), a native of Lucca who had trained in Florence, has been proposed as the co-author of the Marsuppini angels. Note, in particular, the angel on the left (fig. 2), his more fully developed hair and less refined eyes, and compare it with the hair of his pair of Angels in the Cattedrale di San Martino, Lucca, from circa 1480 (fig. 3). 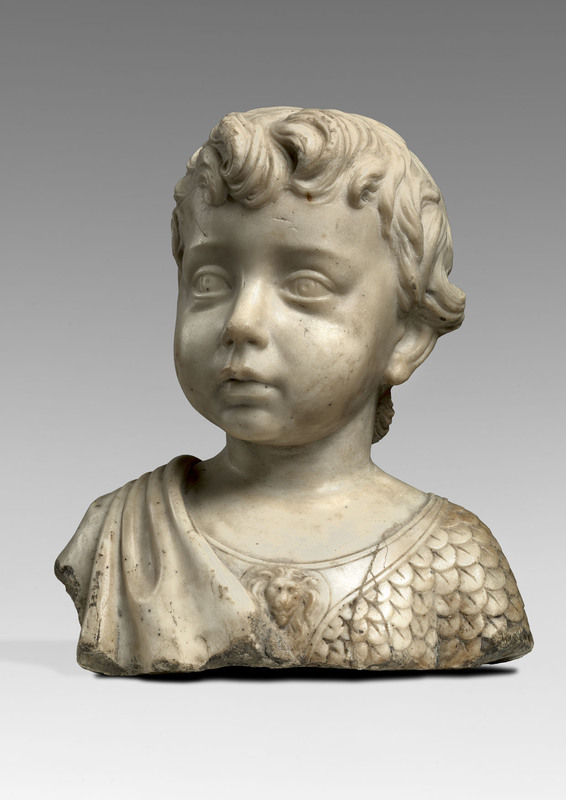 The vogue for busts of young boys, often unidentified but frequently depicting a young Christ or St John the Baptist lasted until the early decades of the 15th century. These would sometimes be commissioned by patrons to adorn private palaces or family chapels. Aside from Desiderio, some of the most important artists of the time tried their hand at this genre with considerable success. 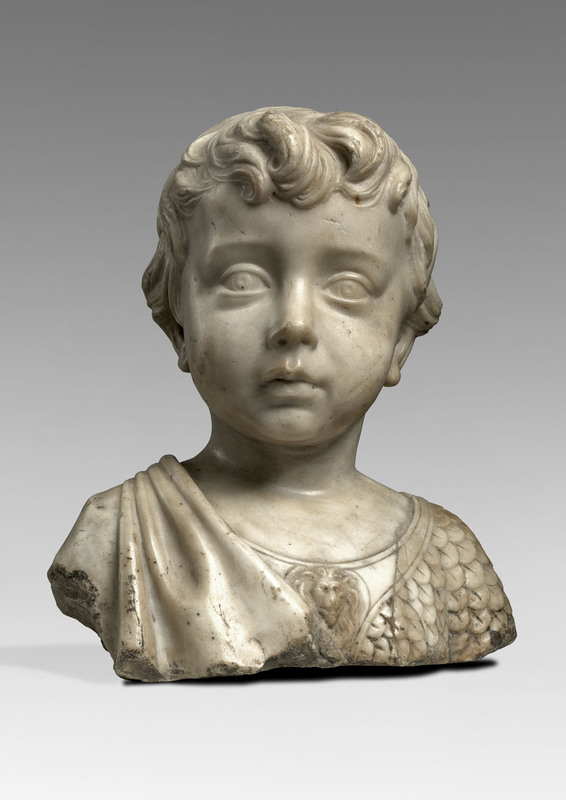 See, for example, Mino da Fiesole’s St John the Baptist (circa 1466, Metropolitan Museum of Art, New York), or Antonio Rossellino’s Bust of a Boy from around 1460 (Palazzo Davanzati, Florence). These artists developed however a style that effectively contrasts with Desiderio’s, and is just as distinctive. Rossellino’s type is perhaps best exemplified by the angels in his Tomb for the Cardinal of Portugal in the Basilica di San Miniato al Monte, Florence. Giorgio Vasari, Le vite de’ più eccellenti pittori, scultori e architettori, Florence, 1568, p. 417. For a discussion on Desiderio’s bambini, see A. Luchs, “Les Bambini”, in op. cit., pp. 160-75. Cf. M. Bormand et al., op. cit., p. 51.